1. Please brew water to clean the water tank for the first use or after using for a long time. 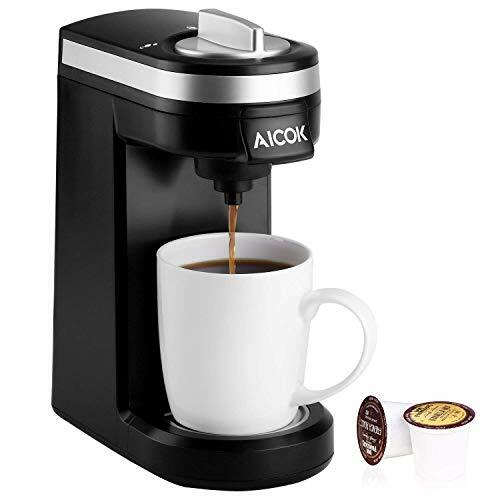 ✔ FAST BREW TECHNOLOGY - Aicok single cup coffee maker fits your most single cup pods, including k-cup pods. And also can work with reusable k cup coffee filter(Not included).It takes about 2 mins making a cup of fresh delicious coffee! ✔ EASY TO USE AND CLEAN- One button and auto shut off, using the latest brewing technology, let you enjoy your flavors easily, such as milk-based specialties, hot chocolate and whatever tea or coffee brand you love! Easy to clean with the removable drip tray,12 oz/360 ml water tank. ✔ BREW HOT ENOUGH - There is no need to put in the microwave, the warm coffee about 185℉(85℃) is ready for you to drink in every rushing morning. ✔ LIGHT-WEIGHT TRAVEL COFFEE MAKER - With compact design and durable construction, the Coffee Brewer is perfect for home,office,dorm room,campus,camping,apartment,caravan,etc.You can take it when travelling for a leisure time. ✔ CERTIFICATIONS & 2 YEARS WARRANTY - BPA-Free quality & UL and ETL certifications ensure your healthy leisure life. Add it to cart and enjoy your fragrant coffee trip! If you have any questions about this product by AICOK, contact us by completing and submitting the form below. If you are looking for a specif part number, please include it with your message.